One thing we’ve focused on this year is making sure we continue to learn new things. For February, in honor of National Heart Month and Valentine’s Day, we decided to learn more about wine tasting. So naturally, the first thing we did was Google it, and then we bought a couple bottles of wine to try out. First things first: 1) Get a notebook. Or some way of remembering what wine you liked and what you liked about it. Hint: Knowing that there’s a dog on the label isn’t going to help. 2) Commit to a plan. 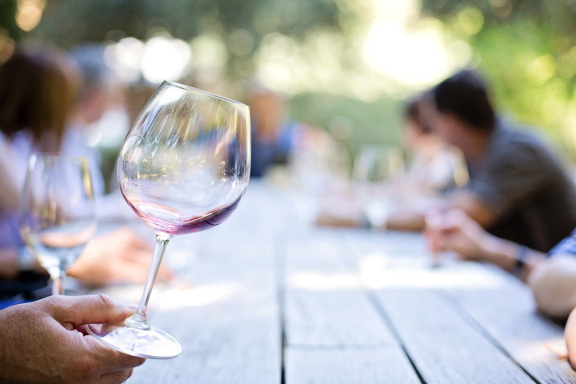 If you’re tasting more than a couple wines, plan A) to imbibe in small portions and/or B) to spit it out after tasting. If you’re sauced, you’re not going to be able to taste, analyze, and take notes on what you’ve observed. The pros spit it out. We prefer to taste in moderation. 1) Look at it: Take notes on the color, brightness, clarity, and viscosity. For some, this is optional, but it might help you recognize characteristics that translate to flavors you like. 2) Swirl and sniff: Swirling the wine in the glass releases aromas, and smell is a big component of taste. Does it smell fruity, floral, earthy, or spicy? Other scents? 3) Sip and roll: Observe the sensations of the wine as it crosses your tongue, front to back, and side to side. Note the flavor and the mouth feel. Is it sweet or sour? Velvety or flat? 4) Think about your experience before, during, and after tasting. Does the flavor persist after the wine leaves your mouth, or does it fall off? 5) Most importantly, Did you like it? Write down what you think. As we said, this is barely the tip of the iceberg. You can learn more as we do at Wikihow and The Vine Daily.